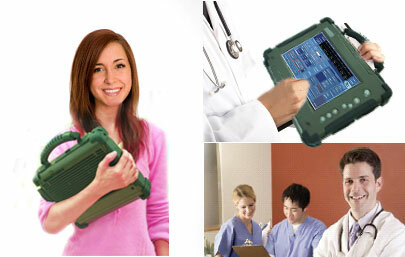 Medical Rugged Tablet PC - Say Goodbye to the Clipboard and Unwieldy Patient Files! Say Goodbye to the clipboards and unwieldy patient files! With real-time updated patient information on your Rugged Tablet PC!!! The trend in medical healthcare applications is to get patients’ information in real time for a quick response. Cost saving, online data available everywhere and reduced loading of personnel are the key benefits of this solution. Physicians, clinicians, nurses and ambulance workers who take care patients can focus on helping them, instead working with papers and reports. We are proud to announce the UL60601 Medical Equipment Certified 10.4” V280 Rugged Tablet PC supporting versatile wireless function for any medical application. different from normal commercial Tablet PC’s, we provide highest reliability in every days harsh environment using. supporting Wi-Fi, Bluetooth (build-in), 3G, GPS, RFID scanner or IrDA peripherals for medical usage. Interfacing with any equipment and getting online information immediately. With using of solid-state disk or Compact Flash card as the main storage, the Tablet PC is running very stable and is immune while in operation for vibration or shock. Fingerprint devices as external peripherals can guard patients information and lock it for unauthorized access. 4 hours battery life with warmswap function can support you in your whole day long job with an easy way to change the battery. The hand-strip and shoulder-belt are welcome accessories to lighten the weight in daily longtime using. Thru the Docking Station the Table PC connects easily to your local workstation and can support any desktop document jobs. 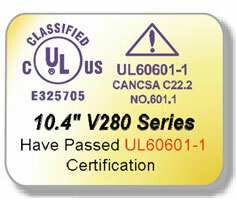 Ongoing UL60601 Medical Certificated Project - 8.4” IA80 Atom Series!